Welcome to Theater of the Sea! We are an educational and entertaining marine animal park where performances are up close and personal. At Theater of the Sea you can swim with dolphins, sea lions, and stingrays in their natural salt water lagoons through our interactive programs. The lagoons, and lush, tropical gardens at are home to Atlantic bottlenose dolphins, California sea lions, sea turtles, tropical and game fish, sharks, stingrays, alligators, marine invertebrates, colorful parrots, and birds-of-prey. MISSION STATEMENT To provide a wonderful home for our animals while sharing them with visitors in ways that inspire awareness and sensitivity towards animals, the environment, and conservation issues. While some of our animals were collected and others were born here, many are non releasable as a result of imprinting and/or injuries sustained in the wild. The health and well being of the animals takes precedence over all other interests and their care and maintenance is supported by patronage alone. Theater of the Sea is open 365 days a year. The ticket counter opens at 9:30 a.m. EST daily.Swim with dolphins in the Florida Keys with Theater of the Sea's Swim with the Dolphin program! Get into the water, swim and request trained behaviors, such as hugs, kisses, and dorsal tows from Atlantic bottlenose dolphins. You will also have an opportunity to snorkel the surface and below, allowing you to interact with the dolphin who will accompany you, all within a natural salt water environment.Theater of the Sea's Swim With the Sea Lion program is a unique way to experience these fun loving, intelligent and fascinating animals. The interaction takes place in a natural salt water lagoon where participants do trained behaviors with a sea lion such as hoop jumps and hugs.Graceful, gentle and fascinating to watch... 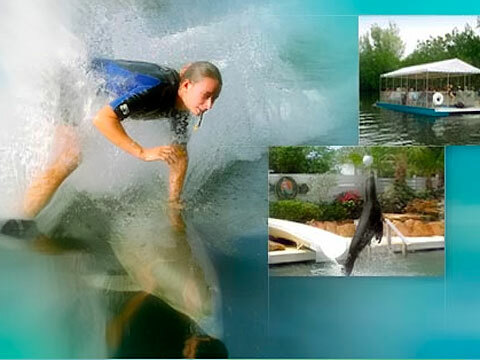 Experience the thrill of swimming with southern stingrays! Feed, touch, and swim with these docile, beautiful creatures. You will be able to interact with the stingrays in shallow water on a sandy beach. While snorkeling you will be able to observe many types of tropical fish - without going to the reef!